When you need to organise the smooth and painless relocation of your office from A to B, but you are being pressured left, right and centre by more important things like business engagements, or social and family commitments, then the whole project might seem like a mammoth task, or even impossible at times. If you are looking for a way to make the whole office relocation process easier, and more manageable for yourself and your staff, then don’t try and do the impossible, but let us make everything possible, and straightforward as we can organise and provide you with the most attentive, efficient and affordable office removals in Biggin Hill. We have been an active part of the industry for quite some time now, and have gained some invaluable knowledge and expertise as to what makes a good quality office removal that is actually worth our customers’ while. The company has the necessary manpower and technical capabilities to plan, carry out and complete successfully any type of office removal, regardless of its size or complexity. We will do everything we say we will, in order to meet and exceed your service expectations and give you outstanding results just as expected. As the leading provider of high-end business moving in Biggin Hill services, we operate with some of the best removal vehicles in town. All our vans are clean, navigated through the latest GPS tracking devices and come with loading and safety gear that is going to guarantee the safety of your sensitive equipment and expensive office furniture. We are not going to let you down even one bit. In order to avoid damage or misplacement of expensive office equipment and machinery we work with specially trained, professional movers who know their work inside out and will be more than capable to expertly deal with all aspects of the office removal process. As we need to cancel out the risk of damage, and ensure safe and efficient transportation, our mover teams will take care of packing and securing of your office contents. In terms of technical capabilities, there is no load too big or too heavy for us to haul, as we own and operate a fleet of well-maintained, transport vehicles of different payload capacity which means we can be extra flexible and efficient with our removal transportation. Versatile transportation translates to fewer service costs for our customers. When looking for the best office removals in Biggin Hill make us your top choice, because we can make it happen. Biggin Hill is notable for being the only town in Greater London that has a post town code for Kent. 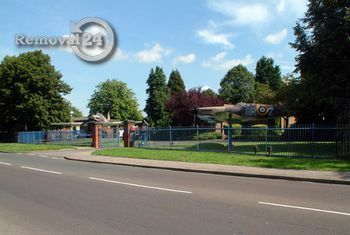 Biggin Hill is also one of the highest settlements in the capital, with an elevation ranging between 170 meters and 210 meters. The proximity of a former WWII airbase led to the commonly shared believe that Biggin Hill is also one of the most haunted areas in London. Hayes station is the nearest railway station to here.